All parents have hopes and dreams for their children. Parents of special needs children often have to grieve the loss of “what would be”. They must face the fact that their child might not be the football star, the ballerina or the honor roll student. When our daughter, AnnaKate, was diagnosed with Rubinstein Taybi Syndrome we, like many, began to grieve the loss of normal. AnnaKate was developmentally delayed, had no speech and was far behind her peers. Our life became doctor’s appointments and therapy sessions. There was not much time for play dates and dance lessons. 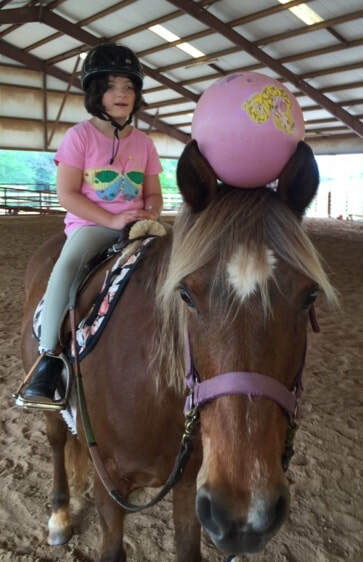 When AnnaKate turned 5, we heard about the Happy Hooves Therapeutic Riding Program at Eden Farms. 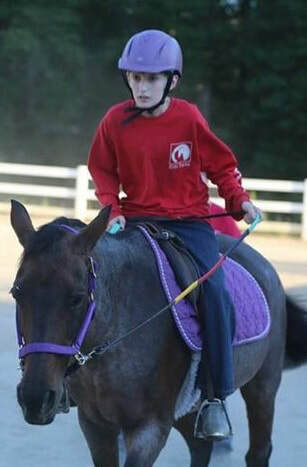 I was unsure what benefits therapeutic riding held for AnnaKate. However, during her very first session, she spoke her first word ever! ​From that point on, we made therapeutic riding a weekly priority. I was amazed at AnnaKate’s gains each week. Her core strength and balance improved, her speech began to come faster, and her fine motor skills were also improving. I told anyone that would listen about Happy Hooves and their amazing facility at Eden Farms. With already having speech, occupational therapy and physical therapy in our weekly schedule, I had thought we had all the bases covered. But Happy Hooves turned out to be the “glue” that combined all of AnnaKate’s therapies, and it was where we saw the most success. Along with gross motor, speech and fine motor skills, I love the confidence and self-esteem AnnaKate has gained through riding. She loves being in the barn with able-bodied riders her age and even taking her lessons alongside them. Please join our family in supporting this amazing organization. Your generous gifts will absolutely make a difference in a child’s life! My name is Paige Sowles and my thirteen-year-old son Walker has Autism. He has been a rider at Happy Hooves for a few years now so when I was asked to write this year's letter, I immediately said yes, thinking it would be easy. As I went to put pen to paper, I realized I was wrong. How can I convey ALL that Happy Hooves means to us in one short letter? With Autism comes many challenges. It's learning how best to help Walker live in a world not meant for people like him. It is very isolating. For Walker, there aren't many friends. There are no sleepovers or team sports. Walker only watched for years as his brother and sister went and did so many things. Always the observer. Then came Happy Hooves. When Walker goes to the farm, he is no longer in a world that doesn't understand him. He can be himself. He will tell you, "Eden Farms is MY place!" He has a sense of accomplishment and confidence. No longer is he without friends. The trainers give him love, encouragement and accept him just for who he is. He has also made friends with many fellow riders and looks forward to seeing them every week. But, as much as he loves the people, his truest friend is "his" horse, Rose. When talking about Rose, Walker will say, "She always knows how I feel and what I'm thinking! She understands me without me having to say any words at all! She can read my mind. Rose is my very best friend!" How do you put a price on that? As a mother, I never will be able to fully express my love and gratitude for what Happy Hooves has given to my sweet, beautiful son. Please, help support this unique, life changing organization making such a difference right here at home in Upstate South Carolina. From the Happy Hooves riders and their families, we thank you from the bottom of our hearts! Just over one year ago, our family’s world was turned upside down. Our beautiful blond-haired, green-eyed 3-year-old son, Luke, was diagnosed with Autism Spectrum Disorder. A very different life journey began for our family, noticeably unlike most around us, which made us often feel very alone and isolated. Luke was in a world not designed for him and, when we did venture out, trust me when I say that we felt that difference all around us. As our family bravely continued on, we began each day hoping and praying for guidance, growth, and a place outside of our home that we could call a refuge. As we juggled multiple therapies, I cried out to God for guidance. God heard my calls for help, my “Mama prayers” for her son! He heard my pleas to show me the path before us and to please guide my family to where we need to be for Luke and our family. It all happened one summer day when I was searching for a summer program for Luke. I knew of his immense capabilities, but sadly, I also knew that team sports would not be an option. I wanted to explore horse therapy and had hoped it could offer my son the immense benefits it offered to other people with special needs. There were a few farms closer to me, but I was literally drawn... pulled to Happy Hooves. I cannot explain it but I knew deep within that this was the place I needed to take Luke... this was the place God told me to go to. Two weeks later, with my two small children tucked in their car seats, we headed up to Happy Hooves. As we turned onto the beautiful tree-lined drive and started up the hill towards the barn, I caught a glimpse of our destination. That is when I literally felt a piece of my soul fill up; I didn’t feel weary anymore, and I knew we had arrived! Happy tears streamed down my face as we met the amazing people and saw the majestic horses. As I saw my precious son totally engulfed with pure joy as he jumped up and down and pointed out the horses to me and his little sister, a piece of my heart healed that day. We met new faces, but it felt like we were already family; we truly felt we were seen as beautifully unique and whole. I felt safe here and so did my son, Luke. Luke has grown immensely during his horse therapy. Once being very unsure of riding, he quickly formed an incredible and undeniable bond with his horse, Buddee, and his caring and compassionate therapist, Nicole. This experience has opened up a whole new dimension within Luke and within all of us as a family. Luke rides Buddee with anticipation, joy and a sense of pride. He is eager to see Ms. Nicole. His self-confidence and autonomy have blossomed. Luke has learned to give verbal riding commands to Buddee, to trot, and even gives his Mama and baby sis flowers during his therapy sessions, which always makes me cry. He is happy... he is proud. I am happy... and I am so very proud! Being surrounded by the most genuine and caring people as well as the unconditional acceptance of horses, I feel like we found a piece of Heaven on Earth at Happy Hooves. I cannot imagine our life without the serenity that we gain from coming here, and I thank the good Lord above for this amazing blessing! Happy Hooves is a place of healing and hope... of love and companionship. This is a sanctuary... and a refuge to many. I encourage you to consider donating to Happy Hooves and give a gift to an undeniably special organization that supports our very own here in South Carolina. Let’s all make sure we give to a beautiful organization like this, so they may continue their charitable work in serving all those with special needs... to give to another child and their weary family a place where they’ll find acceptance, love, peace and healing just like they have given to my son and my entire family. 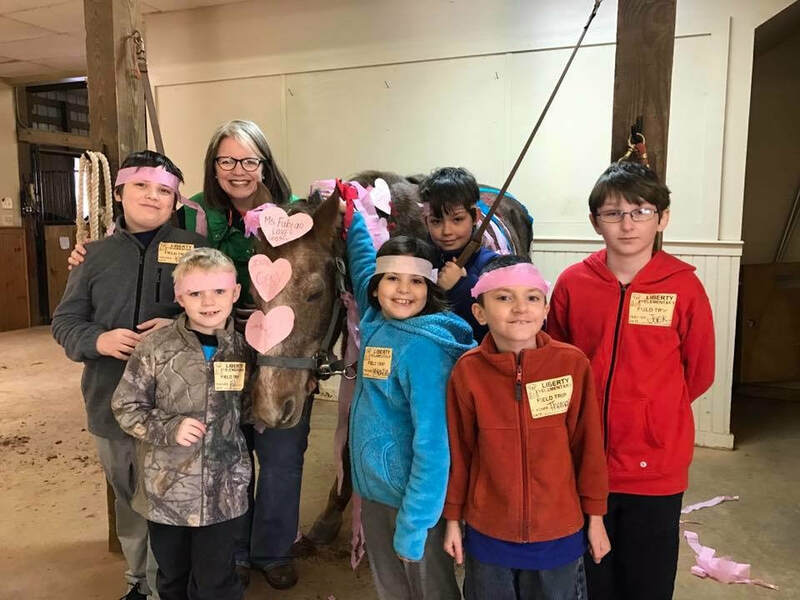 “Happy Hooves has made a huge impact in the lives of my students! The monthly visits to Eden Farms have given them a safe and tranquil place to deal with some of life’s struggles. It would take a long time to touch on each situation and the positive outcomes. There are many situations that will forever stand out in my mind! One of the students that participated in the program never smiled. I had known him since he was in Kindergarten and had never seen a smile (and had tried many strategies to find a smile!) From the minute we arrived at Eden Farms this student grinned from ear to ear. He planned for our next trip to the farm and would give me a count down to the number of days until we returned. He brought a dollar with him each time to give to Eden Farms so the horses could continue to eat. They gave him a receipt for the dollar and he was so proud to contribute. I finally have pictures of him smiling! Another student found herself ready to be done with life. She had a plan to not live any more. After a few visits to Happy Hooves she decided that she had something to look forward to. She now talks about the future and she has goals and dreams! It is a mystery to me how animals can calm, comfort, and teach humans. This happens every day at Eden Farms and especially through the Happy Hooves program. I have students that have learned valuable life lessons on those beautiful rolling hills. The smiles and hugs that welcome each person to that little piece of heaven make a difference. I am forever grateful to the owners, staff, and contributors that make this program possible. There is no doubt that they truly make a difference in the lives of the students and this community." ​Hope Happens. Sometimes the best therapy is stroking a velvety nose.